Exciting News! 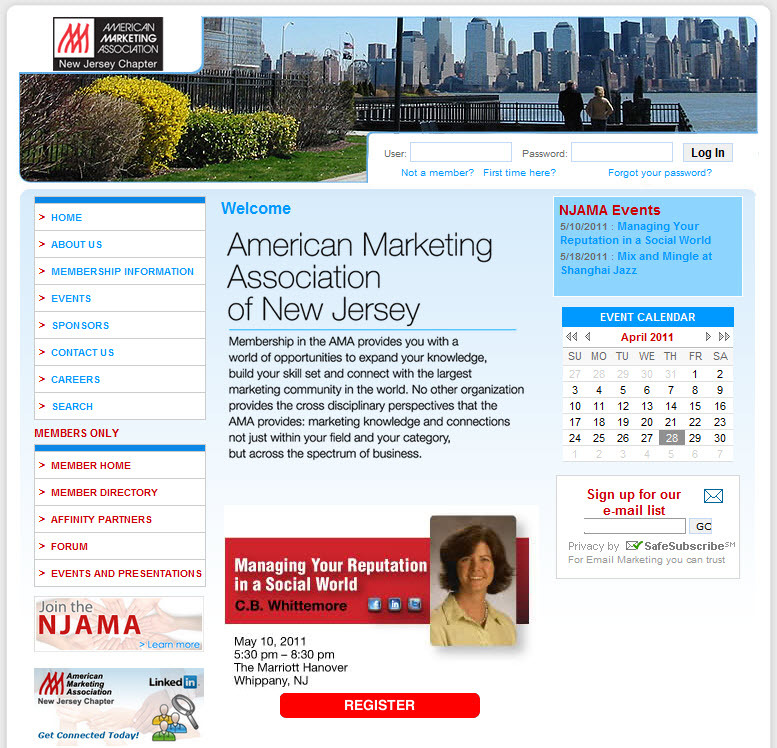 The New Jersey Chapter of the American Marketing Association [AMA] has invited me to present "Managing Your Reputation in a Social World" on Tuesday, May 10th, 2011, at the Marriott Hanover in Whippany, NJ. The event starts at 5:30pm and ends at 8:30pm. You may remember that this is the topic I addressed during my MarketingProfs inaugural online seminar on March 10th - "Managing Your Reputation in a Social World". For reference, here is my summary of links and references: Managing Your Social Reputation: Highlights. I'm looking forward to doing this event in person and hearing what questions come up. To register for the event, visit EventBrite for Managing Your Reputation in a Social World. NOTE: If you aren't a member of AMA, but would like to attend as my guest, simply enter VIPGuest when you register and you'll be eligible for the AMA rate rather than the guest rate. Please let me know if you have any questions. The EventBrite registration page includes a great deal of information on the event. If you'd like to read more, here's a link to the press release: NJ AMA Presents 'How To Manage Your Company’s Reputation in a Social World' 5/10, Marriott Hanover. Thank you and I look forward to seeing you at the Marriott Hanover!